Sediment builds up in reservoir water and can prevent dams from operating properly. EPFL researchers have come up with a method of keeping sediment in suspension and allowing it be flushed out. All dams on earth, from the Mauvoisin Dam in Valais Canton to the Xiaowan Dam in China, have the same problem: sediment accumulating in the reservoir. This situation is commonly addressed by ‘dead storage’ capacity at the bottom of the reservoir, where alluvium is able to settle. But if these silt deposits are never cleared out, the reservoir will become blocked in as little as a few decades and turn into a sandy beach. A team from EPFL has developed a clever way to address this problem: submerged water jets create turbulence that keeps tiny sediment particles in suspension so that they can be carried away through the dam’s water turbines. This process, which is designed to prevent some sediment from settling to the bottom and may even stir up silt already on the bottom, is set to prolong the useful life of reservoirs. The team's work was described in Chemical Engineering Science and the Journal of Hydraulic Engineering. One of the standard approaches to clearing out sediment is through the rapid release of water through the dam every 10 to 20 years. This is a radical maneuver, however, that effectively clears out the reservoir but frequently devastates everything downstream, including fauna and flora. It is still one of the most common methods used today, yet it is subject to severe restrictions in terms of the volume of water and amount of silt let through. Another possibility is to clean the alluvium from the dam. This is a very expensive undertaking, though, since the sediment can build up over dozens of meters or even a hundred meters along the dam. In that case the money can be spent on increasing the height of the dam in order to create more capacity. But this is simply a stop-gap measure that is not even always possible; when it does work, it is obviously a temporary solution since silt continues to be deposited. The approach based on submerged water jets was tested in various configurations in EPFL's Laboratory of Hydraulic Constructions. In a 12m3 tank, four water jets were installed and 3kg of walnut shell powder were poured in. “Ground walnut shell is the same size as the sediment but slightly lighter, and so we can use it to effectively extrapolate what would happen in the dam reservoir,” said Giovanni De Cesare. The water jets are positioned to create rotational flow. The researchers found that four jets in a horizontal plane worked best. They also discovered something remarkable: depending on the height of the jets, the direction of rotation changes and increases the zone in which the turbulence has an effect. And the turbulence sends the particles off in all directions rather than confining them to just one zone. The engineers then transposed their results to a real-world situation: the Mauvoisin Dam in Valais Canton. 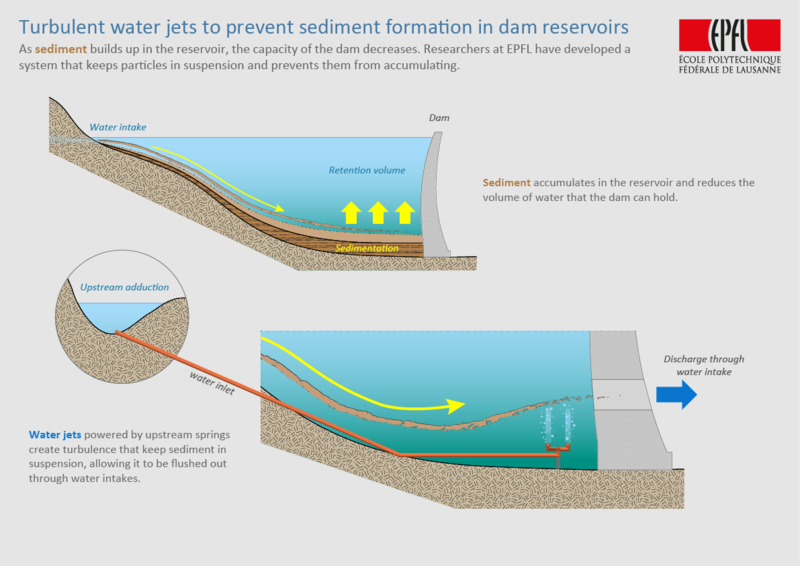 Preliminary calculations of the effectiveness of the water-jet technique show that 20% of sediments could be prevented from settling at the bottom of the reservoir each year. The water jets at Mauvoisin could also work non-stop as they would be powered by a natural spring that feeds into the reservoir from over 100 meters up, which would provide sufficient pressure. A prototype is in the works and will be tested on several dams in Switzerland as part of the Swiss Competence Center in Energy Research – Supply of Electricity (SCCER-SoE).